Paul McCartney's new album "Kisses on the Bottom" will see the legendary Beatles' singer harking back to the golden era of Hollywood, bringing both old favorites and new compositions to his latest musical offering. 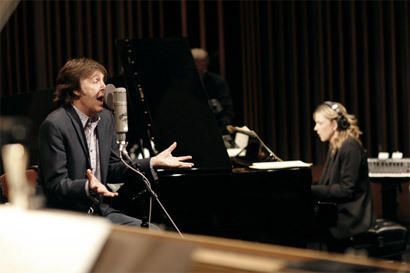 "Kisses on the Bottom," named after the lyrics on the album's first track "I'm Gonna Sit Right Down and Write Myself a Letter," will showcase the former Beatle on a "deeply personal journey" singing classic American songs that inspired McCartney and bandmate John Lennon when they wrote songs for the Beatles. "When we grew up, we had my dad's or in John's case, his mother's era that we were listening to, and then when we came to write rock and roll songs, this informed the rock and roll," McCartney told reporters in London on Thursday. He added the Beatles' "Honey Pie" was one such track "harking back to Hollywood." The ex-Beatle said he was inspired by some of Hollywood's best known actors and singers, including Frank Sinatra, Dean Martin and especially Fred Astaire, whose style and voice were a reference for McCartney throughout his career. "Fred Astaire was just this fantastic character from that era, he's so elegant. Musically, his vocal style is very interesting... he had this little voice that I kind of wanted to get near, so I tried that and that became a little bit of a signature with this album," said McCartney. "It's this era that I love, it's a rich era for style, music and intelligent art." Despite wanting to do this album "for a long time" through both his Beatles and solo careers, McCartney was forced to delay the record after British singers Robbie Williams and Rod Stewart released their own albums of big band classics. McCartney did not want to appear as if he was jumping on their "bandwagon." "The album wasn't going to be the direction that everyone else was taking, so the songs are not quite as well known as some of the songs that Rod's been doing," said the singer. 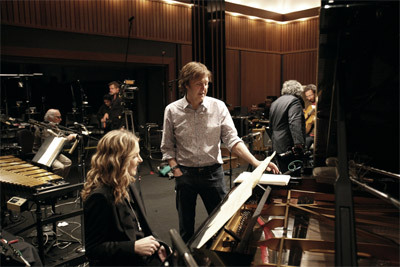 McCartney teamed up with producer Tommy LiPuma and Grammy-winning jazz musician Diana Krall to record "Kisses on the Bottom" in London, New York and the famed Capitol Records studios in Los Angeles. He picked old favorites such as "More I Cannot Wish You" from the musical "Guys and Dolls" and a slow version of classic song "Bye Bye Blackbird." 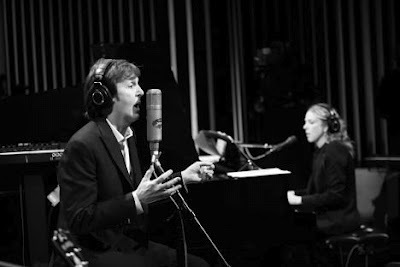 McCartney also collaborated with legendary musician Stevie Wonder on "Only Our Hearts," a tribute to the music of the '30s and '40s, and Eric Clapton on "My Valentine," one of the singer's favorite tracks on the album and a love letter to his new wife, Nancy Shevell. "The fact that I was working with great jazz musicians altered something. I don't know what's been altered, but it's really cool," the "Yesterday" singer said. McCartney dropped hints that songs from the new album may be part of his upcoming performance at the London Olympics later this year, and also said that if asked, he would perform for Britain's Queen Elizabeth at her upcoming Diamond Jubilee festivities. "Kisses on the Bottom" will be released on February 7.